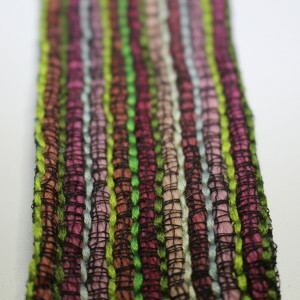 Recently, I’ve been experimenting with a woven cloth sample. I made this using indigo- and madder-dyed cloth. This allows you to make a small amount of cloth go a good deal further so it’s good for large scraps. I assembled it by weaving the coloured strips in with some plain white, and then incorporating a few oddments to fill up gaps/add a bit of interest at the edges. Once I’d put together something that I thought looked quite interesting I tacked it to a base of lightweight calico to hold it all together. Then I just set off embroidering bits and pieces without thinking too much about what I was doing, just to see what would happen. This has been with me for a while. I’ve embroidered it on train journeys, as a passenger in the car and picked up at home in odd moments. It’s nice to have an on-going, not very serious project, to pick up and put down. But I think I’ve now done as much as I want to on this, and I’m going to move on to something else. While I’ve been working on this, over several months, I’ve been reading Jude Hill’s Spirit Cloth blog, and I’m sure I’ve been influenced by what she does, although I’ve not been trying consciously to copy. But I think it’s worth acknowledging her work which is very beautiful. One of the habits I got into when doing the City & Guilds courses was to ruminate, once I got to the end of something, about what I might have done differently. The conclusion on this one doesn’t require a lot of rumination. I realised straight away when I started it that I’d made a bit of a blunder with the materials. Most (not all) of the cloth you see in the photograph is taken from an old cotton sheet (lace edging just visible over on the left hand side) which I’ve cut up to dye. The weave is pretty tight and it’s been very hard work getting the needle through two layers plus calico. So I won’t do that again. 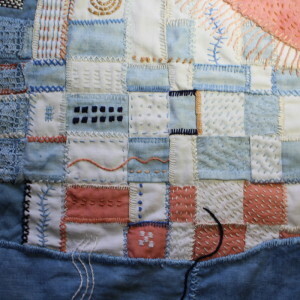 The cotton will be fine for anything that requires machine stitching but handstitching is just too demanding. I suppose the squares (rectangles, really) could be a little bit of a homage to Paul Klee (see previous posts) but actually I started this piece long before I went to that exhibition. What it does reflect is my long-standing attraction to grid forms. I just love those squares and grids. Next photo is a close-up detail of the same piece, included mostly because I’m having a good time taking close-ups with my new camera. Blue and orange are complementary colours, and I chose these quite consciously. Of the classic complementary pairings it’s my least favourite. I don’t know that it works particularly well here, but another mistake I think I made was in using the harsh white for interweaving. Well, next time I put a woven piece together I can reflect on these mistakes and try to avoid them. 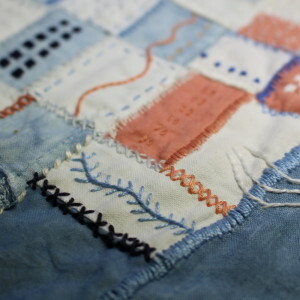 Corded quilting is a traditional technique that involves stitching parallel lines through two layers of fabric, and then running a cord (usually a length of wool) through the channel. There are lots of illustrations showing the traditional Italian or French corded quilting available on the internet. This is one of those techniques that I didn’t think I’d like until I tried it, but once I had a go I became quite enthusiastic about its potential. With all the traditional stitching and construction techniques it’s interesting to push at their boundaries, varying materials, colours, textures and so on to produce something that’s a bit different. You’ll see from the photos below that this sample doesn’t bear much resemblance to the traditional images of corded quilting that you can find by scrolling through Google Images. However, it is fundamentally the same technique. This sample uses two layers of fabric. The lower layer is green cotton (although it could be any colour as you don’t see it in the finished sample) and the top layer is black cotton netting. 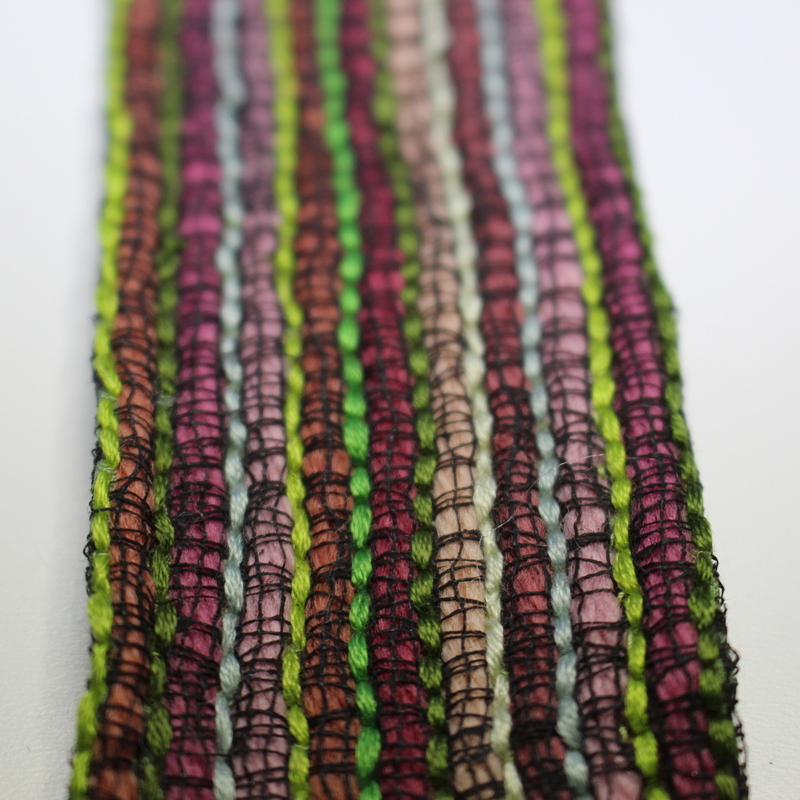 I stitched these together using parallel lines of back stitch in various colours – greens, pale pink and white – of stranded cotton (using 6 strands). Then I took various shades of pink tapestry wool and pulled a double line of wool through each set of parallel lines. Normally, the wool used in corded quilting would be a neutral shade because it isn’t seen; its function is solely to provide texture. However, because the top layer of fabric in this sample is netting, the wool shows through. 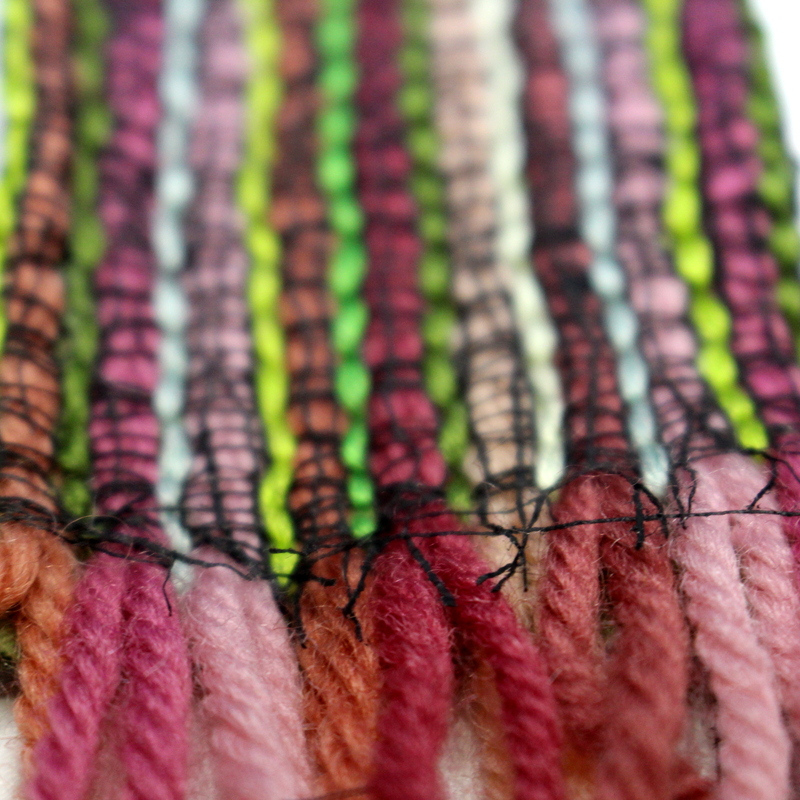 The second photograph shows the end of the sample where the wool is left untrimmed; this shows the various pinks I’ve used ranging from pale sugary pink through to pale russet brown. When I’m selecting colours for samples I quite often use complementary colours, either by design or accident. The red/green complementary pair is probably my favourite. When making this sample I didn’t definitely decide that I was going to use red/green; its just an example of my subconscious preference, I suppose. One of the aspects of the Paul Klee exhibition at Tate Modern that I liked a lot (see earlier post) was spotting his use of complementaries. I’ll have the opportunity for another look this week as I’m going back to Tate Modern for a second look at the exhibition on Thursday.